The solution I’m describing here is for SD quality preview and good enough for alignment of the cameras, it is not intended to provide a Full HD quality and resolution with the idea of the whole setup to be very affordable and mobile. Not that you cannot go for a better quality solution, but you might have to sacrifice some of the mobility you get or purchase much more expensive hardware to be able to do that, and if you go for Full HD preview quality you might as well go for directly capturing from the cameras and not recording the footage on their HDDs. What I’m using here is a pair of Easy Cap USB video capture adapters , because these provide quite good SD quality and come very cheap – you can get them for even under $10 USD each. So these get connected to a laptop to get everything mobile, for portability you might get them connected to a smaller netbook should you need that, or if mobility is not needed you can use a portable nettop or even a normal desktop PC. If you are going for a Full HD preview then you need a suitable HDMI capture card and these are of course available, but you’ll have to get around $200 USD for each. I’m talking about the more affordable Blackmagic Design’s Intensity Pro and Intensity Shuttle products. With the Intensity Pro being a PCI Express based add-in card that needs to be inserted in a motherboard and the Intensity Shuttle using USB 3.0 interface which makes it possible to be used with a compatible laptop and not just a desktop PC. You can of course even go for the Blackmagic Design DeckLink HD Extreme 3D add-in card that is stereo 3D ready and has HDMI and SDI inputs for capture, but you’ll have to prepare $900+ USD for it and that makes it quite a bit more expensive, although it offers more options and additional features. So up to here we have the two cameras/camcorders with their video out cables connected and then in turn the video out cables connected to the USB capture cards plugged in a PC or a laptop. So now we have the ability to preview and/or capture single streams coming from each of the cameras or camcorders with pretty much any software that supports video capture functionality. However we need a special software that will have to combine the two separate video streams coming from each camera into a single stream that can be in turn previewed or captured in a compatible stereoscopic 3D video player. There are a few such programs available, but here I’m using Peter Wimmer’s Stereoscopic Multiplexer and after that we’ll also need the Stereoscopic Player from the same author for the 3D preview part. Both programs are commercial, meaning that you need to purchase a license, but there are also free evaluation versions that allow you to try them and purchase a license should you decide they do the job you need them to. 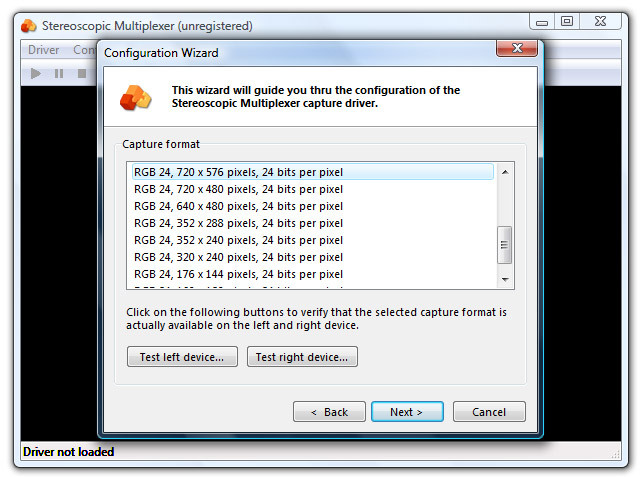 After you install and run the Stereoscopic Multiplexer you need to go over a few simple steps in order to setup the two capture devices, with the first one being to actually select the right capture device for the left and for the right camera. You need to be careful here as when using the came capture devices they both have the same name, but if you make a mistake you can get back and correct it at this point. Also be careful not to select other capture devices available in your system, other than the ones you are using that are connected to the cameras. The Easy Cap USD capture adapters are being recognized as Syntek STK1150, but the name here might be a different one even you you get the same cheap video capture adapters. The second step from the Setup process is to choose the resolution and mode you are going to be capturing in. As I’ve already mentioned here SD capture adapters are used, so the mode to select is either 720×576 PAL or 720×480 NTSC. You can test if everything works as it should when selecting the mode, it should be the same for both capture devices, by pressing the test buttons for the left and for the right video devices. If everything is working fine, then you may proceed with further setting up the Stereoscopic Multiplexer. The next step offers you to do some additional adjustments, such as to set a specific frame rate for the capture. This is good if you have the camera/camcorder working at a specific framerate like 24, 25, 30 fps and you need to make sure that the preview will also be at the same framerate. Below the framerate option you have some checkboxes in order to rotate the image should you have any of the recording cameras rotated in some way. 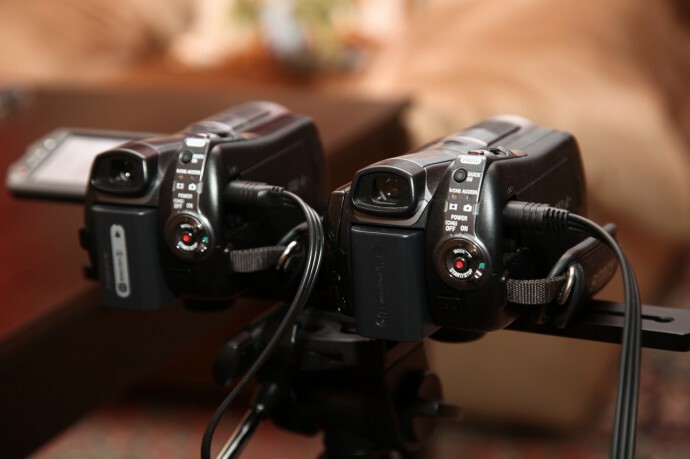 Having one of the cameras upside down for example is not so uncommon when you are making a custom stereoscopic 3D rig, so these option can be very helpful in providing the right video input so that the left and right video can be properly displayed. A few more additional options in the next Setup step, probably you will not have to change anything here. Just a word of caution regarding the Deinterlace mode, you should probably stay away from it, unless you know what you are doing. This is because if you activate the Deinterlace mode you are actually getting the odd fields dropped (removed from the image being shown), so you better leave that unchecked (not selected). Now, you are finished with the setup and you’ll be able to see some preview in the Stereoscopic Multiplexer as well as an option to record the video footage you are getting. However this part of the software’s functionality is not very advanced and you don’t have a lot of options, so you should consider using the Stereoscopic Multiplexer together with the Stereoscopic Player. 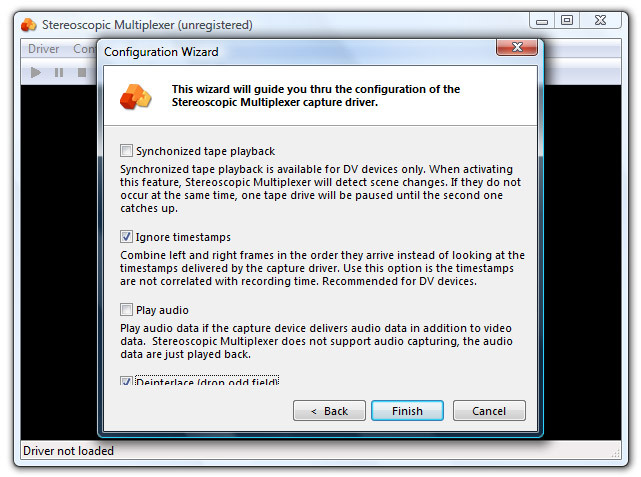 In order to do that you can start the player, open the File menu, go to the Live Video and select the Stereoscopic Multiplexer as the source from the menu (you don’t need the Stereoscopic Multiplexer running at the background if you plan on using it from within another software like the Stereoscopic Player or VirtualDub). Now you’ll be able to preview the content in pretty much any output format supported by the Stereoscopic Player, like for example anaglyph that will work with any display or do a direct preview on 3D Vision-capable laptop or desktop PC. 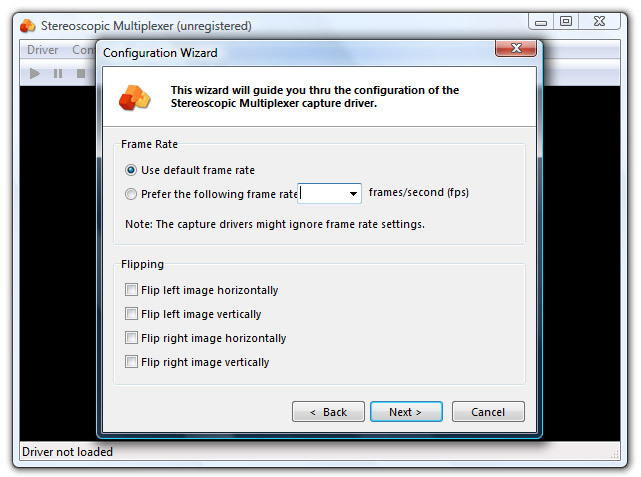 What the Stereoscopic Multiplexer does is to create a DirectShow filter that contains both left and right views in a Side by Side configuration and the good news is that you can use that filter as a capture source in other programs too, like for example use the capture mode of the free Virtual Dub video editor if you need to capture any of the footage coming from the cameras in stereo 3D format. Using the anaglyph output format with a pair of paper red-cyan glasses provides great flexibility as it is practically useful on any kind of display and does not require any specific hardware, so you can go with pretty much any laptop or desktop PC. This will help you get a portable and mobile preview station to go along with your two cameras or camcorders without having to go and buy a new laptop with a 3D-capable display – pervasively polarized or with active shutter glasses. By using the anaglyph mode you can also quite easily spot vertical misalignment of the two cameras and do the needed fixes, so that you will not have to do any fixes for that in post production of the video after you’ve already shot it. As you can see on the screenshot above my two Sony SR11E camcorders did have some vertical misalignment that I was already aware of even before working out the live preview procedure, after recording and previewing some test 3D footage. However with the live preview I was able to easily fix the issue in no time, by doing some modifications on the metal bar holding the two cameras together by being able to see in real time the alignment after the modifications to perfectly match the two cameras. 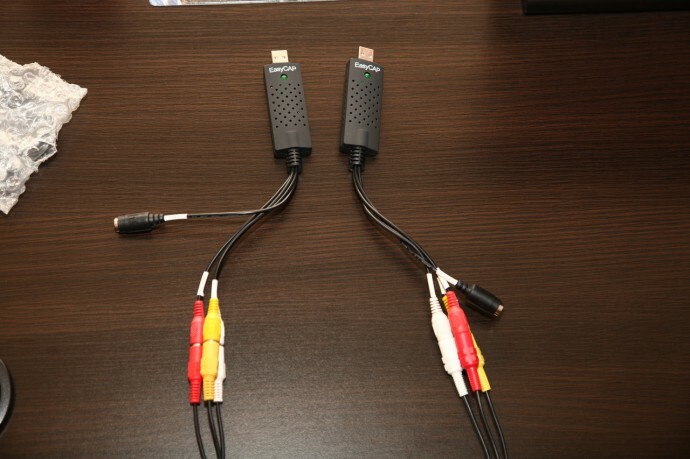 Because i just want to buy 2 usb easycap, exactly for what you described. -which you have? The cheapest DC60 model, or the DC60+? -if you select not to deinterlace the input, you can set it later in player, not to drop fields, but another method? BOB or Blend? So i can get very smooth, 50fps preview? Or only interlaced video with horizontal lines? – if you capture audio as well, then it is possible to run a program that search for loud sound in live streams (claps, etc), and compare the time difference, so it can be used as a sync helper? If the difference is too big, i simply switch one camcorder off and on, and test again. We made a circuit that can display the difference from video output sync signal, but that’s not worked very well. It’s random delayed from the actual cmos reading sync. So useless. Maybe audio watching is a better method? There is a slight delay due to the processing, but not much and I don’t consider that as a problem. Yes, you can do the deinterlace with the player or the capture software after that, so it is not an issue that the function in the SM is not very useful. I believe it is possible that you can further process the audio through additional filters, but that will make things harder especially if you use it as a sync marker and want to trigger the recording based on the audio. I’ve got plenty of advice if you just want to do stills. Pulling off 3D video is very, very hard with inexpensive off-the-shelf equipment because of the synch issues. I’m leaving that to the GH13 hackers. Even the device manager or something doesn’t show the chip name? I order the DC60’s, hope it will work. I ordered two easycap and have some problem. The first is: at every windows boot, i get a message about a new hardware, and have to show to driver folder, and install it. But only for one easycap, for the other i don’t have to, it’s installed. I do it on an Acer laptop with 4 USB2 port, with XP SP3 and latest multiplexer and player. No! Every cap is working. In order to do that you HAVE TO CLOSE THE MULTIPLEXER, after that you can start the player, open the File menu.. I thinked i have to left open the multiplexer, and this create the virtual sidebyside video. But not, the player use the multiplexer if it wants.. And because the multiplexer use the device, the player cannot access it. Now, only my “always install one cap at boot” problem still exist. 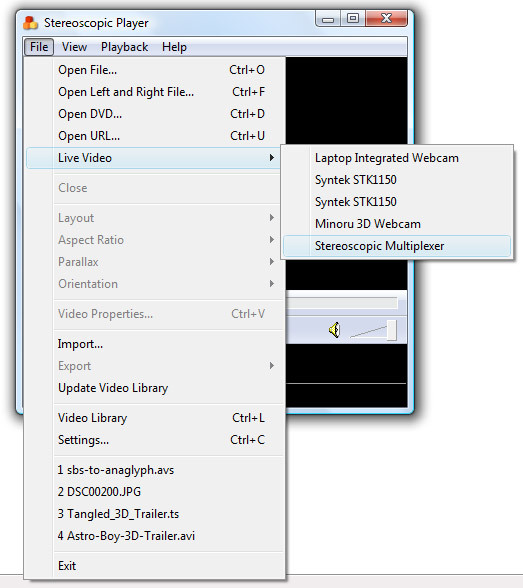 Yes, you don’t have to leave the Multiplexer running when you plan to use it from another program like the stereoscopic player or virtualdub for example. I’m running this configuration on a acer 5738D with polarized screen. I had to install two different capture device, one like the one show in this post, and another one from dazzle. But then It works very fine. Just some problem to find drivers for W7…. About the decklink Hd: I was wondering if it works— has anybody tested it? For Hd preview I suppose you maust have a very performing pc , isn’t?? are you able to preview this on the “gamer” NVIDIA 3D Vision package? or are you using PRO? 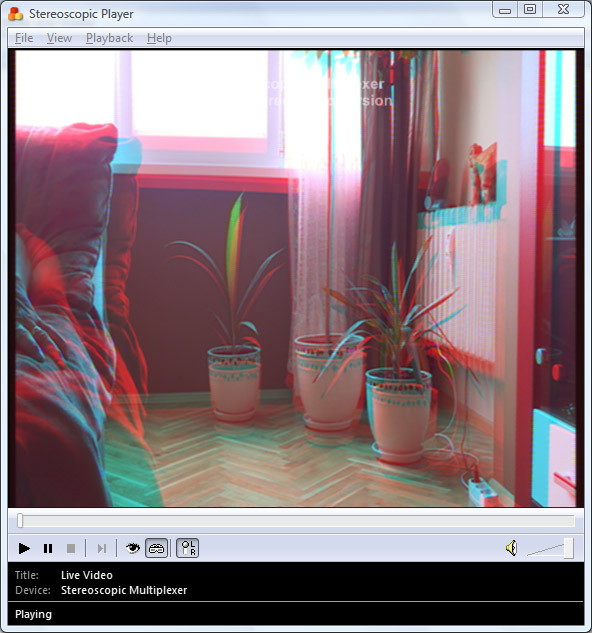 You can use every method that the Stereoscopic Player supports, including 3D Vision and QB OpenGL or anaglyph etc. What about programs like Cineform or Vegas Pro, do those work with the nvidia standard 3D vision package? No, not yet as far as I know, you need to have a Quadro card with a 120Hz 3D LCD monitor and the 3D Vision glasses. 3D photos? If I have a L and R photo, can I match them and create a stereo image with the GeForce standard 3D Vision package? Is there a program that will help out? I’m considering this configuration for HD preview. Would I just have to substitute in a couple of HD capture cards (ie hauppage HD PVR). Would you still consider this to be the best live preview method, or are there any updates you would make. Can you recommend a couple of consumer cameras that have live HD (via COMPONENT b/c I’m considering Hauppage). Is there a HDMI method? I am trying to get two easycap devices to work at the same time on the same computer. Unfortuantely, if I am recording from one, the second one is just black. Which drivers did you use for your EasyCap devices. Ian, are you using the stereoscopic multiplexer or you are trying to record from them separately using different software? I am using a different app (that I know can record 2 video streams simultaneously). I have use 2 KWorld DVD maker usb video capture device and can record the video streams simultaneously just can’t do it with the EasyCap devices.When I saw your setup it would appear the it should work. I will try the steoroscopic multiplexer to see if that works. I’ve only tried it with the stereoscopic multiplexer and it works fine, with other apps there might be some driver conflicts when you have two of the same easy cap devices…. Thanks for commenting. Since the devices show up as separate devices in Device Manager, and since it appears that the Stereoscopic multiplxer just accesses the devices, it is surprizing that it would work in one case and not the other. Also, did you notice that if, when you restart your computer, you had to reinstall the device drivers if you had more than one device hooked up to your computer? What about hardware (cameras) synchronization? How will stereoscopic multiplexer deal with genlocking?